Shumard oak is named for Benjamin Franklin Shumard (1820-1869), physician and geologist. He received his M.D. in Louisville and practiced medicine in Kentucky before becoming a geologist in Missouri and Texas, and later returning to the practice of medicine in St. Louis. Regional names include spotted oak, Schneck oak, southern red oak, and red oak. Shumard oak is easy to confuse with other red oaks. 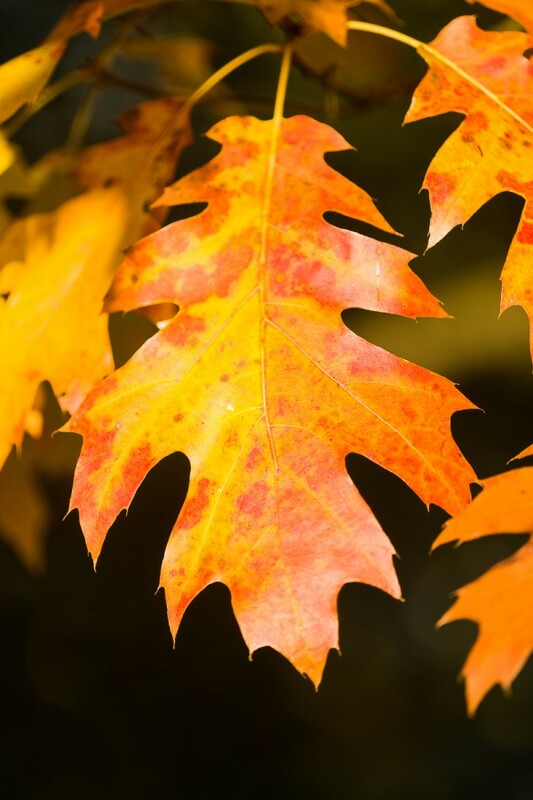 In the Bluegrass, many trees in the red oak group are easy to confuse and there are many trees with characteristics intermediate between Shumard oak and other red oaks. We think that Bluegrass red oaks may be a hybrid swarm. Range: Shumard oak is predominantly a southern coastal plain species from Virginia to Texas. 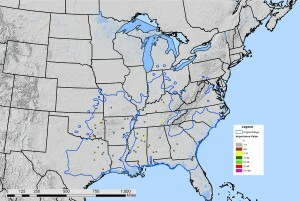 It extends northward primarily on limestone to Kentucky and Indiana. 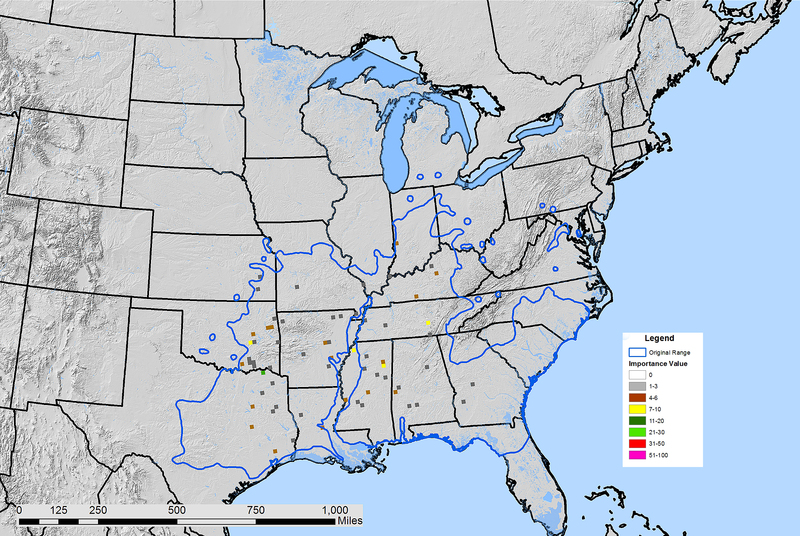 In Kentucky, it extends from the Bluegrass to the Mississippi River Valley. Habitat: In the coastal plain, Shumard oak is found on rich, well-drained soils near rivers, but not in bottomlands, and on bluffs above the rivers. Further north, Shumard oak is found on limestone soils. In the Bluegrass, Shumard oaks is scattered on Bluegrass uplands and more abundant in forests along streams and rivers. Life History: Shumard oak is intolerant of shade, but as with the other Bluegrass oaks, seedlings may persist in the forest understory. 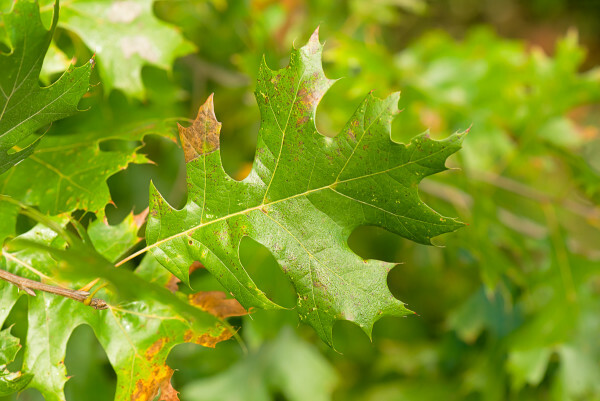 On good sites, Shumard oak is faster-growing than chinkapin oak or bur oak. Shumard oak is a mast-fruiting species that bears abundant crops of acorns at irregular intervals. Longevity is unknown, but some Bluegrass Shumard oaks are probably more than 200 years old. Form: In the forest, Shumard oak is straight with a tapered bole and compact crown. Open-grown Shumard oaks are shorter with broad crowns that are not as coarse as the crowns of bur and chinkapin oak. Uses: An important ornamental. Wood is mixed with other red oaks. Largest Bluegrass Shumard oak: 91 inches diameter, 136 ft tall, crown spread 101.5 ft. (Note: this tree is larger than the national champion; we are inquiring about the status of this tree). Hybrids: Shumard oaks hybridizes with many other red oak species. 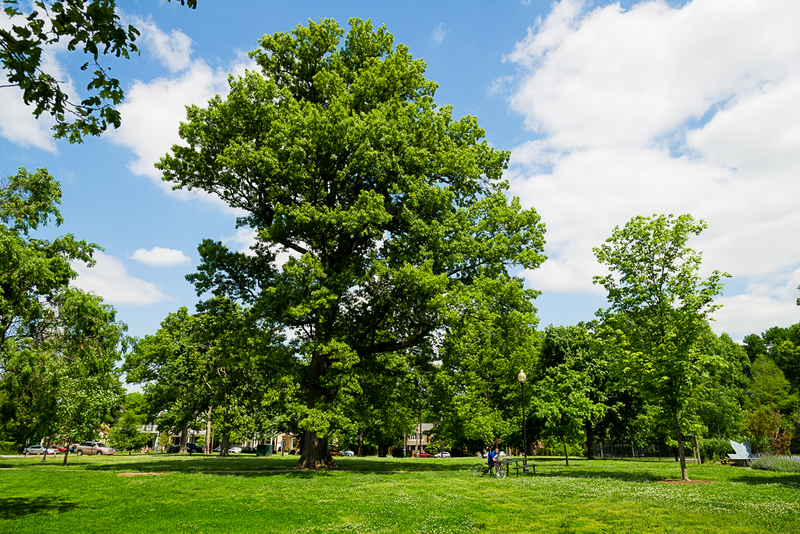 In the Bluegrass, trees with characteristics between Shumard oak and pin oak (Quercus palustris) are common. 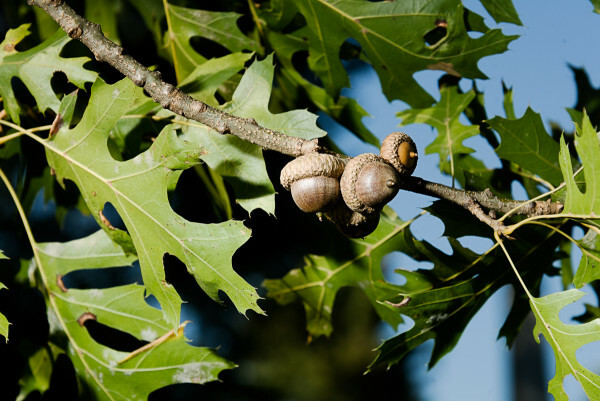 In Indiana, <a href="http://www1.ben.edu/faculty/paldrich/homepage.htm">Preston Aldrich</a> and his colleagues found that northern red oak (Q. rubra), pin oak and Shumard oak formed a hybrid group. Range and importance value of Shumard oak, Quercus shumardii.